Barbizon, Fontainebleau, Auvers, Paris, Bois-le-Roi, l’Oise, Dieppe, Honfleur, Le Havre – this list represents just a sampling of the many cities to which Hippolyte-Camille Delpy escaped in search of an idyllic landscape suitable for the subject of his paintings. Delpy’s itinerant lifestyle, typical of other landscape painters, took him throughout France and into Holland, England, and even into the United States. A landscape painter in the tradition of Barbizon artists of nineteenth-century France, Delpy had the opportunity to study under two of the most well-established landscape painters, Jean-Baptiste-Camille Corot, and Charles-Francois Daubigny, whose individual approaches to representing nature undoubtedly supplied the young artist with a unique opportunity to learn from two artistic perspectives – one from the founding father of landscape painting, Corot; and the other, that of Daubigny, a more contemporary approach based on more realistic interpretations of the natural setting. Throughout his career, Delpy remained a disciple of nature, recording its true and realistic nature while never sacrificing his own artistic reflection. Delpy came from a moderately wealthy family from Joigny, in the Burgundy region of France. He was born on April 6th, 1842 and spent his childhood in this city before attending primary school at St. Andre and later schooling at the College St. Jacques in Auxerre. His father, Etienne Delpy, was a pharmacist who, like many fathers who had established a well-respected family business, was interested in having his son follow in his footsteps and undertake management of the family business. 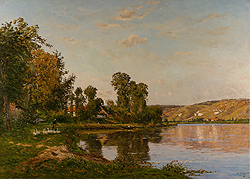 Though Hippolyte had already shown a propensity towards painting, it was not until meeting the respected landscape painter Charles-Francois Daubigny, a friend of the family through Etienne’s brother-in-law, the engraver Lavoignant, that Hippolyte was more thoroughly influenced into pursuing his artistic interests. From 1847 on, Daubigny continued to spend more time with the family, even staying with them during his vacation periods. Under the influence of Daubigny, Delpy was sent to Paris to pursue painting at the young age of sixteen. Recognizing Delpy’s precocious nature, Daubigny undertook training the artist himself, an exceptional act for an artist who rarely, if ever, trained other students. Several nights during the week, Delpy would go to Daubigny’s studio, where he would receive invaluable critiques from one of the masters of landscape painting. 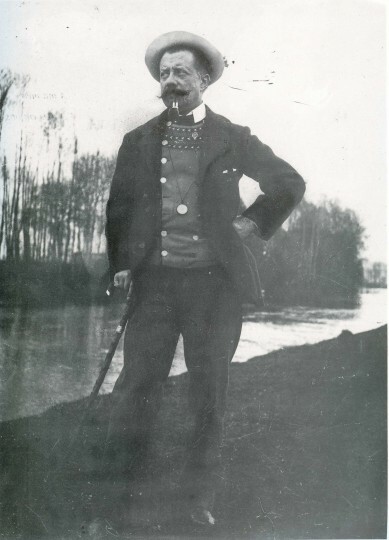 While Paris offered evolving artists a period of apprenticeship in one of the many ateliers, Delpy followed Daubigny to Auvers-sur-Oise where the two of them traveled along the river in Daubigny’s famous “Le Bottin”, the small boat that became Daubigny’s studio and essentially his residence for several weeks at a time. In 1862, Delpy was called on to fulfill his military duties, which kept him occupied until July of 1863, after which point Daubigny introduced him to Corot, whose atelier along the rue Paradis Poissonnière in Paris, Delpy began to frequent. Corot was an influential figure in the Parisian art scene; one of the first artists to introduce to nineteenth century audiences, landscape painting that was, for the most part, devoid of historical narrative. Though these years working under both Corot and Daubigny were of seminal importance for establishing Delpy’s style, little is known about this period of Delpy’s life. It is not until 1869, the year of his first Salon entry, that Delpy’s name begins to be continually recognized among those of the other leading nineteenth century artists. Apart from being accepted for the first time at the Salon, the year 1869 was marked by extensive traveling for Delpy, a pattern that had been established early on and one that would remain a consistent characteristic of his life. He divided his time between his two masters, earlier in the year joining Corot in Ville d’Avray and later returning to the company of Daubigny at Auvers, where he met several other artists, including his future father-in-law, Aman Cyboulle, a flower painter. Interspersed between these periods studying the landscape, he managed to return to Joigny to spend time with his family. Though his first Salon entry, Un Déjeuner de Carême, chez mon père (A Luncheon during Lent, at my father’s house), a still life, his experience in Corot’s studio and alongside Daubigny painting en plein air, the young artist had begun on his path to artistic success. His 1869 debut would begin a career at the Salon that spanned over 40 years. The saddest face would leave this studio happy; here one can work and laugh at the same time. This convivial artist with a warm face is both hospitable and frank; he does not pretend to be an art pundit as he is not yet a pundit of art; at the same time he works and occasionally tells a bawdy joke. Though Delpy was often overshadowed by his famous master, he would eventually become recognized for his own talents, for his own “attractive melancholy” (La France, April 10th, 1875) that could be found in his paintings. One critic, writing in La République Française (February 14th, 1876), wrote poignantly how “Mr. Delpy has revealed himself as a young landscape painter combining Corot’s poetical style with Daubigny’s more naturalistic style in a way that did not exclude his own personality.” Perhaps the melancholic aspect present in his work could be linked to the death of one of his beloved masters, Corot, who died this same year on February 22nd. …artistic event that does not concern the theatre but deserves full attention. An outstanding artist from the young school of landscape painters and the glory of each of our annual Salons, Mr. H.C. Delpy, is selling forty-five paintings of a capital interest at the Hotel Drouot tomorrow on Monday…No doubt, the amateurs will fight over the paintings of an artist who continues with dignity the work of Corot and of Daubigny and combines the first one’s charm to the second’s energy. The sale was a success and each of the 45 paintings put up for auction were sold. Just three years later, however, Delpy found himself in the same financial position and held yet another public sale at the Hotel Drouot, this time comprised of thirty-five paintings, all of which were sold. Throughout the next several years he continued submitting paintings to the Salons as well as maintaining his busy travel schedule. The success of each of his public auctions reflects the popularity of this landscape painter during a period when many other landscape artists vied for equal attention. In 1883, Delpy took part in a witty exhibition entitled “The Salon of the Incoherent Arts,” organized to assist the poor of Paris, which took place at the Vivienne Gallery. Showing the height of incoherency, Delpy exhibited an empty canvas, with characters only painted on the frame. It became a popular venue in Paris for some time and was repeated for several years after its debut, though Delpy only took part in the first exhibition. Despite any lack of participation in later exhibition, Delpy’s initial participation suggests that Delpy was willing to poke fun at the institutions through which he gained his reputation. …Mr. Delpy’s work is brilliant. A significant talent is there. The artist has tackled the complexity of the landscape: the green has been used in a masterly way: the whole range is there without any clashing brightness, without any loud note, in a homogenous tonality and a perfect harmony. The water is beautiful and Daubigny, his master would have signed it. This year Mr. Delpy has established his pedigree. During the latter half of the 1880s, Delpy met Théo Poilpot who encouraged him to go to Washington D.C. where he could work with a group of artists on a panorama depicting the Battle of Manassas during the Civil War in Virginia. Panoramas had become an extremely popular and profitable event in cities throughout America and Europe. After the panorama’s exposure in Washington, it was presented in New York where it received a considerable amount of success. He returned to Paris to represent himself in the Exposition Universelle of 1889, to which he sent three paintings and was awarded an honorable mention for the ensemble. During this same year he also held his first exhibition at a gallery, that of the Artistes Modernes on the rue de la Paix. He later exhibited, in 1894, at the Galerie Georges Petit, one of the most important galleries in Paris. Time sped by, the masters have fallen asleep in a glorious evening: and Delpy, tireless at his easel, did not stop painting canvases that impressed the connoisseurs and the established his reputation. If one only considered his mirth, his never being short of eloquence and his talent that is constantly renewed, one would be tempted to say: “He is a young artist.” But there is the considerable work: this ceaseless production of forty years, this intelligent understanding of nature full of emotion; and at last all the paintings united in this exhibition, pieces of an anthology which are profitable to study, and then one says, “Here is a master”. By 1909, forty years after his debut at the Salon, Delpy’s health began to deteriorate progressively, forcing him to stay in bed for several months. He exhibited for the last time at the 1910 Salon showing Paysans Fuyant devant l’Inondation a Mortot (Eure) (Peasants Fleeing From the Flood at Mortot (Eure)), before passing away on Saturday, June 4th, 1910. No artist’s life was more full of art, more hardworking, more capable, thanks to his will power and philosophy, to triumph over more obstacle than his was. At the most difficult times, at those moments when the problems of existence arose with a harrowing tenacity and their salutations appeared unsolvable, he would go towards air, towards the intoxication of atmosphere and find solace in creating large studies that would bring to his distressed soul the numbing warmth of healthy relief. And this is because he asked that his art – of which Corot and Daubigny had been his godfathers – provide comforting joy, and that he never wanted to make it a vain stage show…The man was as interesting as the painter; but while the first one was sentimental, the second was a bright conversationalist, a wit of the finest and most pleasant skepticism but a sure and delicate friend in his expansiveness. Delpy had achieved a phenomenal success both during and after his lifetime. His paintings render nature with realistic tones but also with a sentimental feeling gleaned from an understanding of the methods of both Corot and Daubigny. The biographical information and the English quotes in the biography were based on Michèle Lannoy-Duputel’s Hippolyte-Camille Delpy, 1842-1910: Invitation au Voyage, Paris: Léopold d’Or, 1989.